When you supply electricity to the home from any external source, you need to avoid exporting power back into the grid. Therefore you need a device that can safely connect your house wiring either to the utility lines, or to your generator, but not both at the same time. Such a device is called power transfer switch. It comes in two flavors- manual and automatic. Automatic switches are used with fixed standby generator systems. They are either included in the set or the system manufacturer provides you with a few choices to pick from. Therefore their selection is pretty much straightforward. Manual devices are normally used with portable generators, although they can be used with stationary systems as well. There are different types of manual switches to choose from. This guide will tell you what types are available, will explain their pros and cons, and will help you choose the right one for your home or business. An installed Siemens interlock kit. Some models run for around $20. Start turning on needed individual breakers one a time, and make sure you won’t overload the genset. To switch back to the service you have to reverse the above procedure. Here is a conceptual diagram of wiring an interlocked switches. Here are the main advantages and disadvantages of this method. Does not require re-wiring of your existing circuits. You just need to install back feed breakers and wire them to a generator inlet. You need to use only an interlock designed for the brand of your existing load center. You may easily overload your genset if you don’t know exactly how much current each circuit consumes. Reliance manual transfer panel for around $130. If your main service panel does not allow an installation of back feed switches, you can buy a separate sub-panel. Note that in practice, what is advertised as a manual transfer switch is actually a system that comprises of two double-pole switches and a mechanical locking mechanism. You will need to operate this mechanism to shift from utility to your generator. If you want to transfer your entire service, you can buy a single-load switch for around a $130. Your electrician will need to open the connection between the service disconnect and existing breakers box and install the changeover panel in between. However, if your generator is not big enough for the whole house, you will still need to turn off selected branches before starting up the generator. Such an option costs a bit more than a simple interlock kit and requires more re-wiring work. Begin turning on individual breakers in the transfer panel one at a time. Note that some consumer guides incorrectly state that with a separate transfer panel you can leave all your branch circuits “ON” when you are starting up the genset. This is not a good idea because the initial surge currents of your motor-driven appliances and lights may overload the genset and trip its overcurrent protection. You do want to power up your loads one at a time. The branches left in the main load box will not be energized during a blackout. When the service is restored, the lights and devices connected to those lines will turn on, alerting you that the grid is back. Note that since the loads which are using backup power are isolated from the mains, there is no danger of back feeding. You will just need to flip the transfer switch back to “LINE” and shut down your genset. This is a special brand of redundant equipment. It’s like a collar that is inserted behind your electric meter. 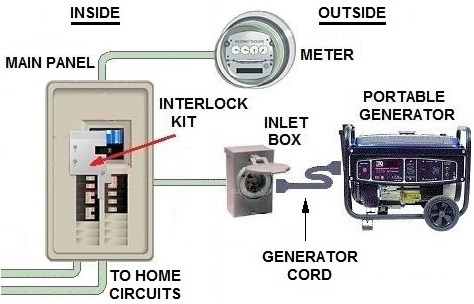 In case of a blackout you need to plug your portable genset to the GenerLink™ inlet and start it up. After that the system automatically switches your house from the line to your genset. Since the installation requires breaking the meter’s seal, it is normally done by a local utility. It may cost $500 to $1,000 installed. If you want, you may check if they allow it to be done by an independent licensed electrician. Some utilities may install GenerLink™ for free and charge some monthly service fee instead. NOTE. The information in this site is provided AS IS for technical reference only without guarantee and liability of any type, neither explicit or implicit. It expresses only a personal opinion of the author, and does not constitute a professional advice- see complete disclaimer linked below. I have what you describe and your explanation here is very helpful. Thanks for that. I have a situation where I have a Generator with a 120-220V 3 Pole 4 Wire Twist Lock female out let both on my generator and on the wall leading to the transfer switch in my basement. I am unable to find cabling with Male to Male Twist lock plugs. Do you have any idea how to get that working? I am willing to make my own but not sure if there are other off the shelf options. Thanks. Nobody is selling male to male cables because they are not safe. If your generator is running and you unplug the house side of the cable, you will be holding in your hands electrically hot plug. The inlet that leads to transfer switch should have a plug not a socket. Instead of having a single main circuit breaker panel, my home has two panels next to each other–and each of them have some critical circuits. Because of this, is it correct to assume that a manual transfer switch won’t work as intended–since you’re really need two manual transfer switches and there’s no way to mechanically ensure you’ve turned both of them off appropriately? Would the next best option be to place a whole house switch between the service meter and the 2 main panels? I prefer a manual switch, since the automatic ones seem very limited in the number of circuits. I’d rather manage my own loads and have the flexibility to use any of them as they’re needed. My generator is an old Onan JC 15KW. Thanks for the info on this site. Although I’ve called electricians, most of them have a wait list several months long. I’d like to have my ducks lined up when I finally get someone to help. You can get a manual switch with a sub-panel and move there the critical lines. If you are still looking for electricians, I am associated with Networx https://www.networx.com/electricians?se=9294 – you can get free quotes with screened electricians.